The inclusion of the Ford Fiesta, above, alongside the electric Volt and Leaf, and Sonata and Lincoln MKZ hybrids, proves that internal combustion engine technology has also advanced to levels of competitive fuel economy standards. The Chevrolet Volt, Ford Fiesta, Hyundai Sonata Hybrid, Lincoln MKZ Hybrid and the Nissan Leaf were been named finalists for 2011 Green Car of the Year honors today. It's the first time the list of finalists has included electric cars: the Leaf and Volt. The winner will be announced during media previews for the Los Angeles Auto Show on Nov. 18. The award, sponsored by Green Car Journal, honors vehicles that represent environmental leadership and technologic innovation. Award organizers said the inclusion of the Ford Fiesta alongside the electric Volt and Leaf, and Sonata and Lincoln MKZ hybrids, proves that internal combustion engine technology has also advanced to levels of competitive fuel economy standards. 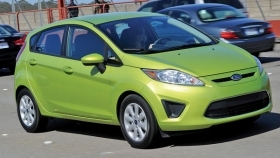 Ford Motor Co.'s subcompact hatchback qualifies for consideration due to its 40 mpg highway fuel economy using a conventional gasoline engine. Nominees for the award can include any vehicle that employs a fuel-efficient powertrain technology: electric, hybrid, gasoline engine, diesel engine or alternative fuels. The 2010 Audi A3 TDI took the honor last year. It was the second diesel model in a row to win the award, after the 2009 Volkswagen Jetta TDI. A vehicle must be on sale by Jan. 1 in order to qualify. This year, auto enthusiast Jay Leno, host of the “Tonight Show,” and former race car driver and auto designer Carroll Shelby will join a jury that also includes Carl Pope, chairman of the Sierra Club; Frances Beinecke, president of the Natural Resources Defense Council; Jean-Michel Cousteau, president of Ocean Futures Society; Matt Petersen, president of Global Green USA; and Green Car Journal editors.